PT Ekploitasi dan Industri Hutan I - PT INHUTANI I or latter known as Inhutani I is a reputable state-owned company in Indonesia, running business in forestry industry. The Company has core business focus on natural forest management and pants forest development and industrial unit. According to Inhutani I's profile as cited by JobsCDC.com, PT Ekploitasi dan Industri Hutan I was established in 1973 to continue the activities of PN Perhutani East Kalimantan to manage forests in East Kalimantan province. Inhutani I was established under the Government Regulation No 21 of 1972. 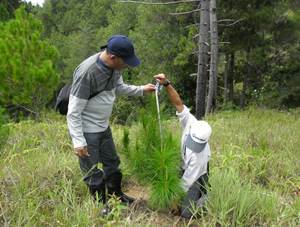 Inhutani I now has 8 Business License Utilization of Forest Timber Trails (IUPHHKHA) with total area of 616,532 hectares and 3 Business License Utilization of Wood Forest Plants (IUPHHK-HT) with total area of 73,316 hectares. Based in Jakarta, Inhutani I now has 4 business units; PT INHUTANI I Balikpapan, PT INHUTANI I Tarakan, PT INHUTANI I Industri Gresik and PT INHUTANI I Sulawesi Selatan dan Barat. The Company's head office is registered at Jl KH Ahmad Dahlan No 69 Kebayoran Baru Jakarta Selatan. 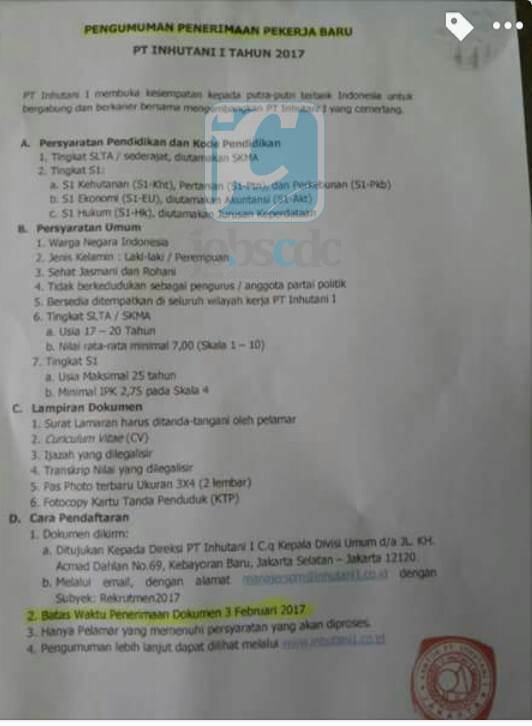 Background in Senior High School or equivalent (SMA/SMK), preferably SKMA. Not located as a trustee / member of a political party. Willing to be placed in all working areas of INHUTANI I. Age around 17-20 years old. Minimum average national exam score of 7.00 (scale 10). JobsCDC.com now available on android device. Download now on Google Play here. Please be aware of recruitment fraud. The entire stage of this selection process is free of charge. PT INHUTANI I - Recruitment SMA, S1 Fresh Graduate Inhutani I Group January 2017 will never ask for fees or upfront payments for any purposes during the recruitment process such as transportation and accommodation.